Can I Catch Up on Sleep? You went to bed too late—again! Now you're wondering, “Can I catch up on sleep?” Ideally, you'd avoid skimping on sleep in the first place, but since it's unavoidable at times, there are ways to pay on your "sleep debt." "Can I catch up on sleep?" It's a fair question that most of us have wondered. There are indeed ways to pay off a "sleep debt," but it's still wiser to make sure your get regular and sufficient sleep. Should you aim for a sleep-in marathon on the weekend? Will a napfest in the afternoon help you catch up on sleep? Raman Malhotra, MD, Associate Professor of Neurology at the Washington University Sleep Center in St. Louis, says either of these methods could help combat the effects of short-term sleep deprivation. Neither, though, is a fail-safe plan. The best way to avoid the ill effects of sleep loss is—no surprise here—to get a good amount of zzzs every night. Since that’s not always realistic, Dr. Malhotra suggests taking naps, sleeping in, and going to bed earlier to help balance your sleep debt. Here’s everything you need to know to finally answer that burning question, “Can I catch up on sleep? 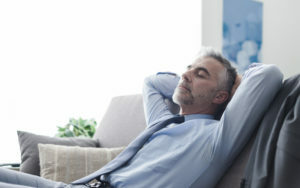 According to the National Sleep Association, the average adult aged 18 to 64 needs between seven and nine hours between the sheets to observe sleep’s health benefits. Those over 65 can get away with six to eight hours. But how much sleep are we getting? The National Sleep Foundation’s 2005 Sleep in America poll found that adults are sleeping an average of 6.8 hours on weekdays and 7.4 hours on weekends. And the Centers for Disease Control and Prevention reports that one-third of American adults get less than the recommended amount of sleep. That’s a lot of people walking around in a tired fog. Does It Help to Sleep In? Sleeping in on the weekend can reverse the impact of mild sleep deprivation over one work week, say researchers of a study published in the American Journal of Physiology-Endocrinology and Metabolism. After six nights of reduced sleep, study volunteers experienced significant daytime sleepiness and a decrease in attention levels as well as a rise in Interleukin-6 (IL-6), a marker of inflammation. After two days of extended recovery sleep on the weekend, their sleepiness and IL-6 levels returned to normal. The volunteers’ attention levels, however, remained diminished despite the extra slumber. The take-home? Extra weekend sleep can make up for some of the negative effects associated with sleep loss, but it won’t affect your focus. A 2018 study published in the Journal of Sleep Research found that sleeping in on the weekend can reduce the negative effects caused by sleep loss. This 13-year analysis followed 43,880 people for 13 years to determine whether sleeping for longer on a weekend can improve people’s health and reduce their risk of death. According to the researchers, those who slept a mere five hours or less per night had a 65 percent increased risk of early death when compared to those who slept for six or seven hours. Members of this sleep deprived group who slept longer on the weekend, however, didn’t notice the higher mortality risk. Although more detailed work is necessary to prove their point, the researchers’ findings are good news for those of us who skimp on zzzs during the week. An afternoon nap—no more than 20 or 30 minutes—is one way to try and satisfy what’s known as sleep debt. Can I Catch Up on Sleep with Naps? “Napping can be a great way to catch up on sleep,” says Malhotra. Aim for a “power nap” in the afternoon. Your body is naturally sleepy at this time, so it will be easier to doze off. Keep your afternoon snooze short and sweet—a half-hour or less. “Longer naps can leave you tired and groggy upon awakening, because after sleeping for 20 to 30 minutes, your body enters deeper sleep,” Dr. Malhotra says. Those who slept for only three, five, or seven hours noticed delays in their cognitive function (i.e., they had slower reaction times). These effects were more dramatic in those who slept the least. After the first night of eight-hour recovery sleep, those who had slept for only three hours a night during the previous week recovered their speed and reaction times more quickly than the rest. So we know we can catch up on some sleep, but does it help to build a sleep “bank”? Yes, according to a 2009 study in the journal Sleep. When examining 24 healthy adults, researchers found those who got extra sleep (10 hours a night) for one week were more alert and showed better reaction times on tests conducted after suffering a week of dramatic sleep deprivation. A small study published 2016 in the journal Medicine & Science in Sports & Exercise agrees. After asking 12 volunteers to add two hours to their sleep for six days, researchers then had them skip sleep entirely for one night. Then, they tested the average time it took each volunteer to become fatigued when performing a knee-extension exercise. The results: Volunteers tired more quickly after a sleepless night following a normal week of sleep. After banking six nights of extra sleep, however, they reached fatigue more slowly after sleep deprivation. In a 2010 sleep study, volunteers who slept for 10 hours after being sleep deprived for five nights felt almost back to normal the next day, but still suffered some effects of sleep deprivation. Researchers believe another day or more of extended sleep may have helped them to recover better. Those who are chronically sleep deprived may take much longer to notice results. Experts advise that you limit afternoon naps to 20 to 30 minutes in attempting to catch up on sleep. But after a night of sleep loss, a longer nap has proven to important, according to research in the American Journal of Physiology-Endocrinology & Metabolism. Furthermore, napping may have a positive impact on blood pressure. add, adequate sleep, blood pressure, cognitive function, cortisol, daytime sleepiness, diabetes, exercise, fatigued, health, home sleep remedies, hormone, how much sleep do I need, infection, inflammation, lack of sleep, metabolism, mortality, napping, recovery, sleep, sleep center, sleep deprivation, sleep remedies, sleep study, sleepless night, stages of sleep, stress, stroke, the sleep cycle, tired. Brilliant ideas and tips about sleep. I have been suffering from sleeping disorders since last 3 years. I followed a lot of people’s advice but none of them gave me the cool sleep. Finally, one of my doctor told me to avoid using smartphone, wifi, and electronic device during sleeping at night. I followed his advice, and now I can sleep. I am really happy. Thank you very much for this well-researched article and information. I appreciate your valuable ideas. I thought you might be interested in this article on https://universityhealthnews.com: Can I Catch Up on Sleep?